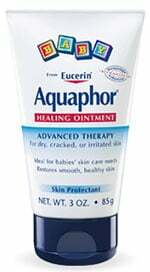 Aquaphor Baby Healing Ointment Diaper Rash & Dry Skin Protect 14oz has been formulated to help you with any skin ailment you may have. Designed to support all skin conditions, Aquaphor skin care products can aid you with repairing, moisturizing, and hydrating your skin. Aquaphor Baby Healing Ointment Diaper Rash & Dry Skin Protect 14oz is ideal for all babies' skin care needs and restores smooth, healthy skin. This mild, multi-purpose ointment provides the extra gentle care your baby's delicate skin needs. Pediatrician-recommended formula soothes, protects and helps heal dry, irritated skin due to drooling, minor burns and abrasions. Effective relief for the dry skin associated with Eczema. Clinically proven to reduce diaper rash within 6 hours. Mild, fragrance-free and preservative-free formula is safe for external use anywhere on your baby's delicate, sensitive skin.